Dr. Dre has reaffirmed that Eminem is wrapping up a new album. “Em is finishing up his project. And for me, man, I’ve just gotten inspired again to go back into the studio, so I’m just really having fun with life and having fun with being creative and trying new and different things with myself, just trying to stay active,” Dr. Dre said. “As you know, it’s been almost 30 years for me in music. It’s a little bit difficult to keep getting inspired to get back in there but you know, music is my first love and I’m going to continue to do that as long as I can.”“Know that he’s not quiet for nothing. If he’s quiet…worry. 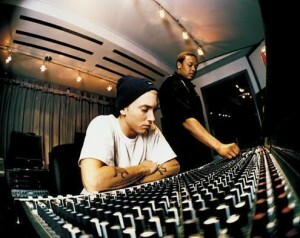 Marshall is like that f***ing huge spider on the floor and you wanna act like you not scared of it. And you’re really not that scared of it as long as it’s in your plain view but if you look away and it disappears oh you petrified, that’s Marshall. That’s Marshall and the petrified people are the rappers because you know he’s not going to come back with nothing but something that’s going to make you second guess what you’re doing.